German Shepherd Gutch - the best dog I have ever had! Gutch is an eight month old German Shepherd. My husband wanted to get a German Shepherd so badly, I was not against it but just worried as we have 3 small children. It turned out I had nothing to worry about. Gutch is the best dog I have ever had. She is almost like having a 4th child (only she listens better). We go for walks a lot and we don’t even need a leash she stays with us and romps around with the kids. We love her so much and I am so happy we have her. Hello Renee. 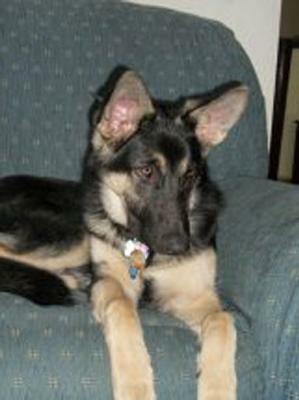 I would like to thank you so much for sharing your great story about your wonderful little German Shepherd puppy Gutch. What an unusual name! It's so nice for you taking the time to come here and tell us all about your German Shepherd puppy story. And I just love the picture - Gutch is so pretty and looks soooooo happy just hanging out with you on the couch!